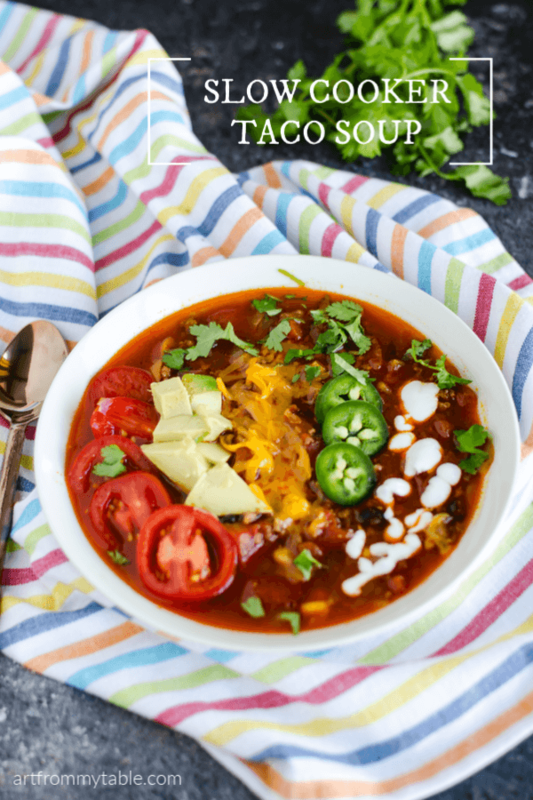 This Slow Cooker Taco Soup is so easy to throw together! It’s full of flavor, using all natural ingredients. Get ready to dump and go, then come home to perfect comforting soup! 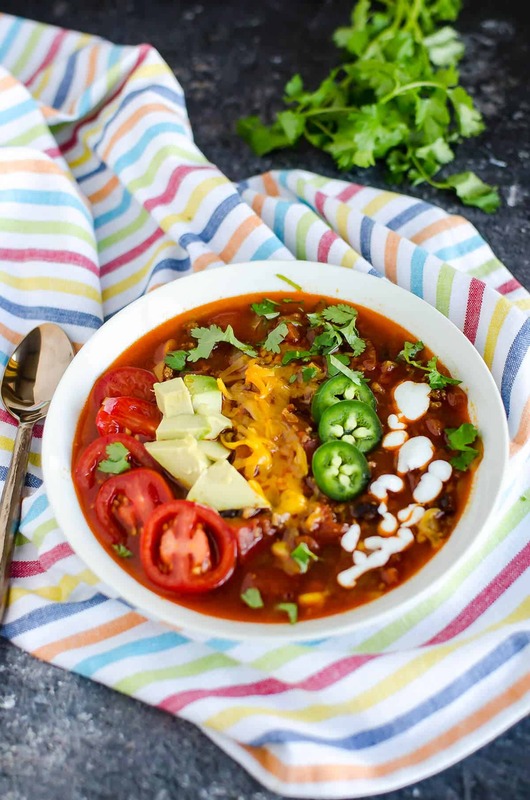 Is there anything as great as Taco Soup? Well, yeah, probably lots, (because I love so much food!) 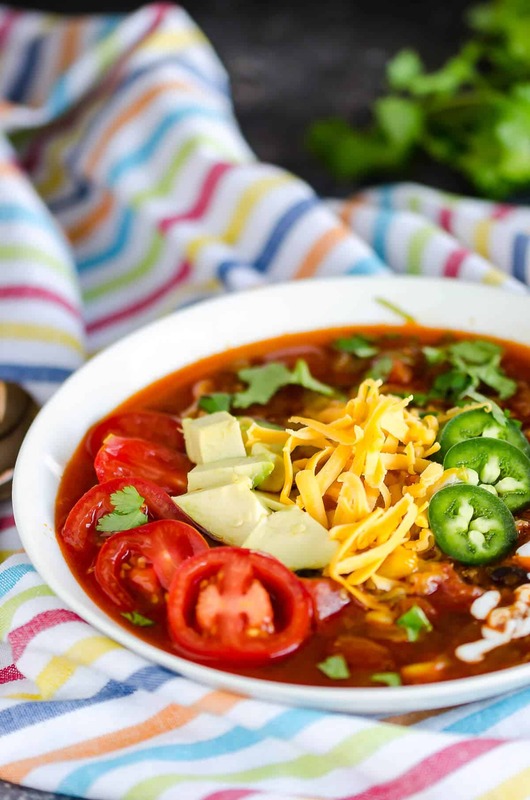 but THIS Slow Cooker Taco Soup is one recipe we just love! Tons of flavor, and easy peasy! Fall has hit the mitten, it’s rainy, soggy, and chilly out, so I can’t think of anything better to have for dinner tonight. Putting this in the Slow Cooker makes it a dump and go recipe that makes your life that much easier. 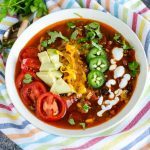 This Slow Cooker Chicken Chili is another favorite, and for a five minute prep slow cooker meal, check out this Sesame Ginger Chicken. Forgot to start it in the morning? 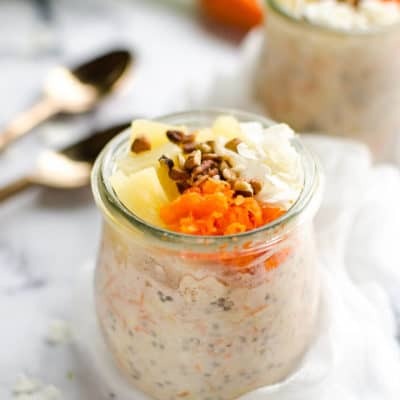 No worries, you can cook this in the Instant Pot as well and have fantastic results. I’m actually using my Instant Pot as a Slow Cooker in this recipe. Ah the versatility! I’ll brown the meat, and slow cook the soup, all in the same spot. Step one: Brown the ground beef or ground turkey. If you’re using the Instant Pot, you can do this on the Saute’ function. If not, just brown it in a skillet on the stove and transfer to your slow cooker. Step two: Add the rest of the ingredients and the spices. Cook on low for 6-8 hours, or on high for 4-6 hours. Step three: Garnish and serve! We love to top ours with shredded cheddar, avocados, sliced tomatoes, and a drizzle of yogurt. The brave ones in my family garnish with jalapeños as well. 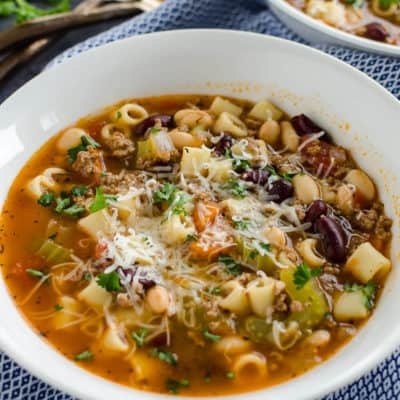 Sometimes I might get too busy before bringing the kids to school to start this in the Crock Pot, so I love that I have the Instant Pot to fall back on. Step one: Turn the Instant Pot on the Saute’ function and brown the ground beef or ground turkey, depending on which one you are using. When it’s just about finished, add the onions and peppers for a few minutes to soften them up. Step two: Add the broth, and scrape up any browned bits on the bottom of the pot. Add the rest of the ingredients and cover, making sure the valve is turned to the sealing position. Step three: Using the soup function, set the time for 20 minutes. When it’s finished cooking, use the quick release method. 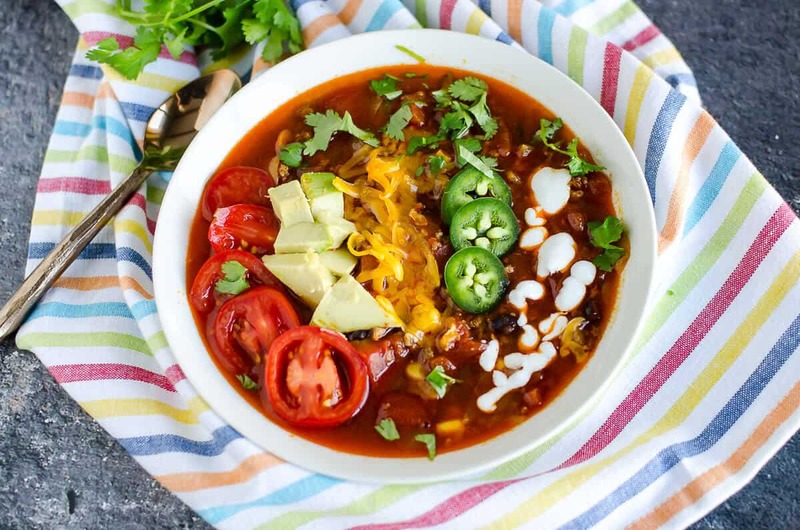 Your taco soup is ready! 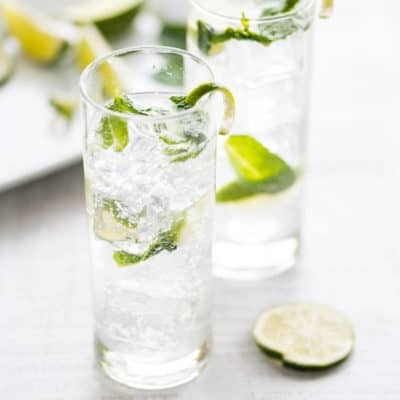 Garnish with desired toppings and serve. Overall, my answer is yes. But I’ve learned that there are a lot of different interpretations of ‘healthy’. 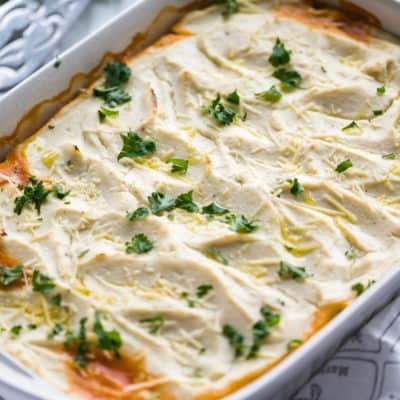 In my opinion, this recipe is healthy because it’s made with real food and whole ingredients. 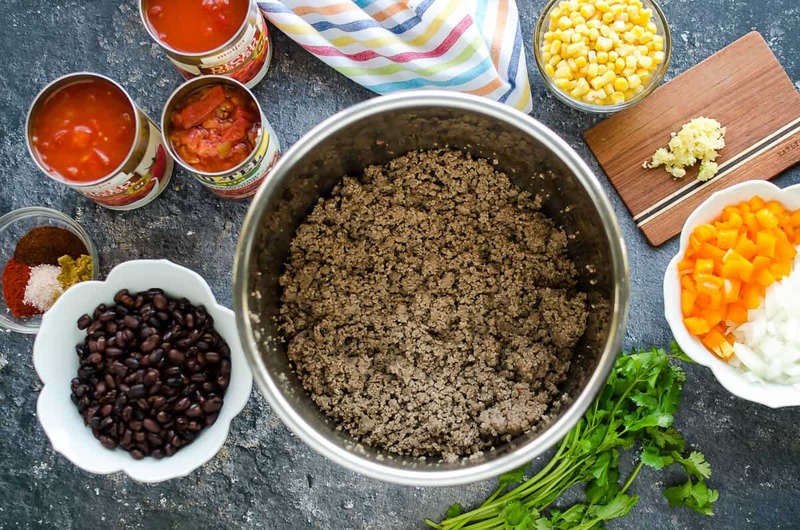 Using ground turkey instead of ground beef may lighten it up. Both types of meat come with different percentages of lean, so, pick a lean one if you’re going for less fat. Drain the meat and rinse in really hot water to make it more lean. If you’re on a low carb eating plan, you can leave the corn and beans out completely, or just use less, which is what I do. This recipe already takes that into consideration. But I don’t dare call it “low carb” because someone will think it’s not just based on those ingredients. ???? Also if you’re going for low fat, limit the cheese and avocado on top. I always use plain yogurt in place of sour cream as a low fat/high protein option. Absolutely! Make a double batch, and you’ll have some left to freeze. Freeze it in a gallon size zip lock type freezer bag and lay flat. Laying it flat will make it defrost quicker when it comes time to use it. 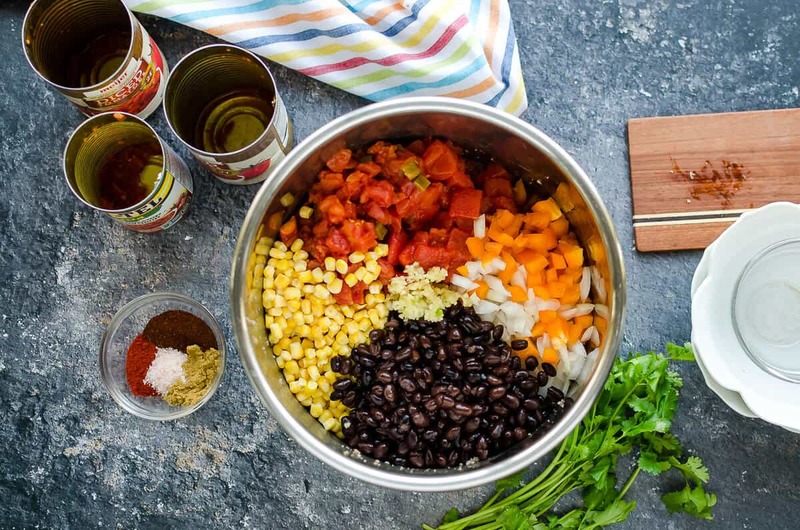 An easy recipe full of all the taco flavor in a soup form. A real food, dump and go easy meal! Brown the ground beef or ground turkey and add it to your slow cooker. 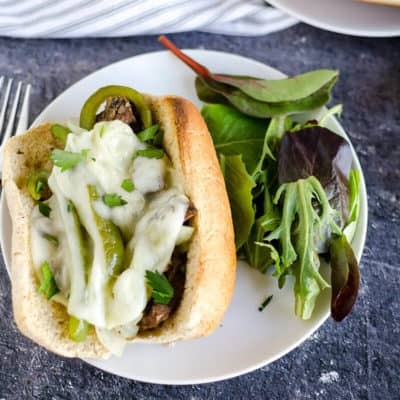 Serve garnished with cheese, tomatoes, avocados, jalapeños, yogurt or sour cream, and cilantro if desired.